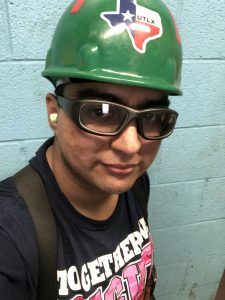 Andy, 21, from Houston, Texas, finished the Welding Specialist with Pipefitting program at Tulsa Welding School & Technology Center in Houston in June 2018. He walked the stage in October at graduation. Thanks for your time, Andy. What did you do after high school? I gave college a try to see if it was right for me. I went to community college for mechanical engineering. In the second semester, I realized it wasn’t for me, so I decided to pursue something else. The first thing that popped into my head was welding. I was in middle school the first time I did welding. I welded a barbecue pit, some table legs and I made a metal rose out of sheet metal. I continued to weld in high school. I didn’t take welding class, I just went to the shop and spoke to the teachers. They let me come in whenever I wanted, as long as I followed the safety procedures. After trying college, I thought, what else could I possibly do? Why didn’t you take the high school welding class? I thought my future was in mechanical engineering, so I focused on that. Welding was a hobby for me. Did you look at other welding schools before choosing Tulsa? I looked into welding programs at community college, but the full course was two or three years. I googled welding schools and found Tulsa Welding School. I read the website, looked at videos and visited the campus. I liked that the welding program was seven months, or nine and a half months with pipefitting. It might cost more, but I’d be finished way sooner than the college course. Why did you decide to do the pipefitting program? I’d never heard of pipefitting before. When I went in to take the tour, my intention was to focus just on welding. But when they mentioned pipefitting and showed me what it was, I thought the technique might come in handy. I decided why not? Knowing an extra technique meant extra money in my eyes. I got along really well with most of my instructors. Overall, they were amazing. Most of them helped me out and guided me, and they came into my booth to show me how it’s done. They babysat us to the point where they would hold our hands to show us how slow or fast we had to do what we were doing. You graduated in June. How long did it take to get a job? It took a while. I continued working at Wal-Mart as an electronics associate for three months. I was browsing around Houston, delivering résumés and talking with career services. For three months, I received no call backs and no interviews. Then I went to my TWS graduation ceremony in October. They had a career fair on campus. I spoke with the companies there. One of them was the Union Tank Car company. They were asking for applicants, so I immediately signed up, had an interview and got a job. Congratulations! What kind of welding are you doing? MIG, flux and stick. Most of the time it’s stick welding. I’m welding tanks: underneath, on top, sometimes inside the tank cars. I’m really enjoying it. It was worth the wait and the persistence. It took a while. How did you keep motivated? It was my stepdad Rodolfo, actually. He kept pushing me to pursue my dream and to keep looking for jobs, even though I wasn’t getting calls back. He inspired me. Sometimes it got annoying because I’d be eating or relaxing, and he’d keep lecturing me. He didn’t think I was listening, but I was. Was it exciting to get your first paycheck? Oh, man, the first thing that popped into my head was shopping! Let’s go to Apple, Best Buy, Wal-Mart—get everything I want! But my mother, Martha, told me to be responsible with my money: she said to save my money to pay off my loan, my car, my credit cards. She told me not to go crazy. She was right. I took her advice. I’m going to be patient, and do the right thing. Right now I’ve just got to focus on paying back my loan, my car and my credit cards. The time to spoil myself will come soon enough. I should have paid off my school loan within a year, maybe paid off my car. That’s when I’ll move out and get an apartment closer to where the plant is located. I won’t have to drive an hour there and back; I can save some gas money and finally have some independence. My three-year plan is to climb the ladder from welder to supervisor, and after that to inspector. I want to keep climbing until I reach the top. When I do reach the top, I’ll still keep shooting higher. Eventually, I might leave and try to pursue something different at a refinery or an offshore oil rig, or I might travel. I want to do it all, except underwater welding, I don’t want to do that. I honestly didn’t know how this career field was going to go for me. I took a huge leap into a whole new world from retail. The real reason I love this job is that it gives me more freedom. I have more space. I can talk to people, do my work and still socialize. I don’t get in trouble for taking a five-minute break. I feel free. It’s a huge difference from working in a retail store. The first thing I’d say is, if you’re working at a place where you’re not happy, make a change. I went from working retail into a trade, and I’m loving it right now. If you’re looking for a place to study, try Tulsa Welding School, because you’ll actually get hands-on training. Believe me when I say that it feels amazing when you light that first spark, then you keep going and going. When you graduate, you can look for work at so many different places. Your world will open up to a whole different universe when you enter your company, your refinery, your power plant or your oil rig. When you enter that world, your life will become a totally different story, especially when you get your first paycheck. Welding is the most fun job you could ever have. If you’re reading this thinking welding isn’t your thing, I’d say for once in your life try not to be so lazy. Give it a try.